Roses “do not require watering, fertiliser or care”-unlike poppies, he says. “We have solid contracts with the farmers who grow roses asking them to stop cultivating poppy and other types of narcotics, and the places where we grow roses are clean from poppy 100 per cent,” he adds. 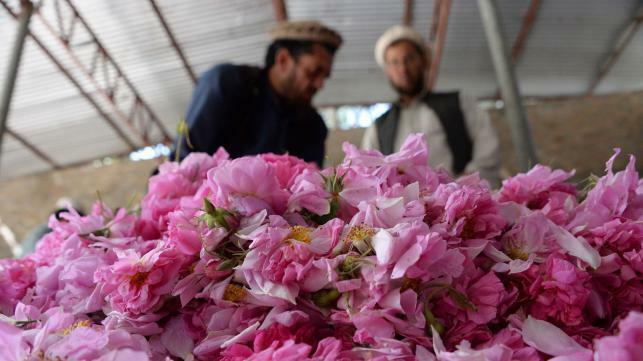 “The roses picked in the morning have to be distilled the very same day, even if we have to work until 2:00am or 3:00am,” explains Mohmand, as bags of petals are poured into seven huge stainless steel vats. He has 100 hectares (250 acres) of roses, but hopes to triple the number of plants next year “if the security (situation) allows”. 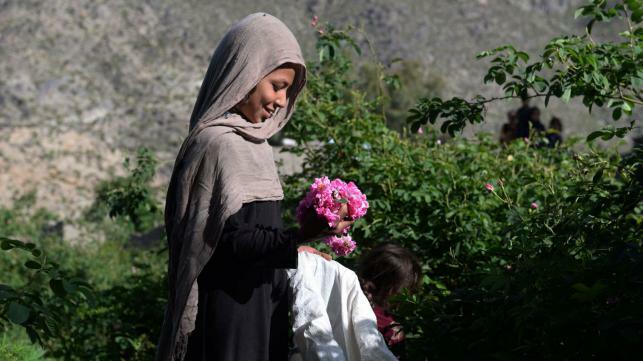 Its rose oil now supplies several European companies, including German organic cosmetics brand Dr Hauschka-whose products are priced well out of reach of ordinary Afghans. Orzala exports its rose oil to Canadian company The 7 Virtues, which also sources essential oils from Haiti, the Middle East and Rwanda under the slogan “Make perfume, not war”.